Wichelen, Sonja van (University of Amsterdam). "Contesting Megawati: The Mediation of Islam and Nation in Times of Political Transition." (Archive) Westminster Papers in Communication and Culture. 2006 (University of Westminster, London), Vol. 3(2): 41-59. ISSN 1744-6708 (Print); 1744-6716 (Online). p. 41-59. 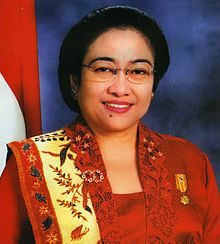 "Most Powerful Women 2004 #8 Megawati Sukarnoputri." Forbes. Karon, Tony. "The Princess Who Settled for the Presidency." TIME Magazine. Friday July 27, 2001.